Leave Holmfirth via Station Road and the property will be found on right hand side after just leaving Holmfirth opposite the car park. (HD9 1AB). An excellent opportunity arises to acquire on lease, ground floor office accommodation occupying a prominent main road position opposite a public car park, and only a short walking distance from the centre of the popular market town of Holmfirth. 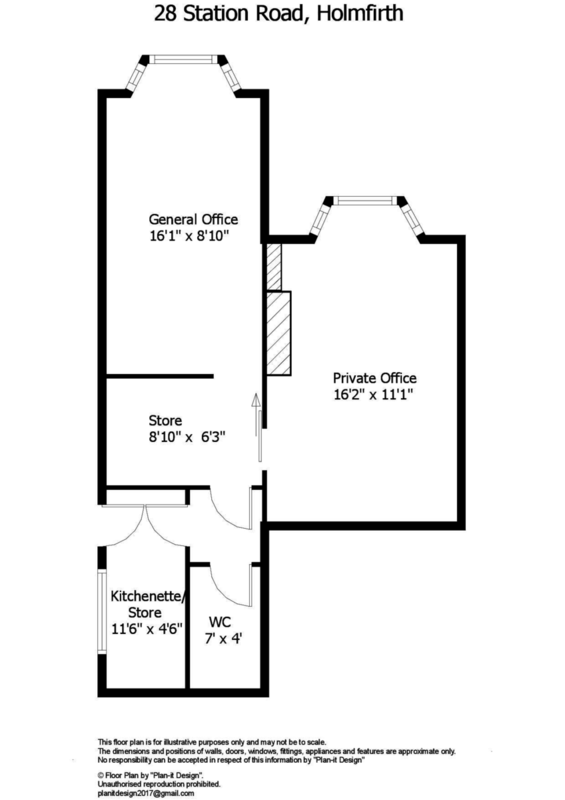 The offices have a total gross internal floor area of approximately 480 square feet. They comprises a large general office, private office, store, kitchen and separate w.c. There are 2 car parking spaces, gas central heating system and UPVC windows. With low flush w.c, wash basin and extractor fan. With sink unit and cupboards, gas combination boiler serving the central heating system and providing hot water, side entrance door. There is parking for two cars parked in tandem on the tarmac yard area at the side of the building. £5,850 per annum. To be paid quarterly in advance. The lease is to be on an internal repairing lease, for a term to be agreed. The tenant will be responsible for the LandlordÂ’s proper legal costs in connection with the preparation of the lease. The building is to be insured by the Landlord and the Tenant will be responsible for a percentage of the total insurance premium. Applications for the Tenancy should be made to the Letting Agents and the usual bankers and trade references will be required. Planning permission was approved by Kirklees MBC for the change of use to offices as defined within Class B1 of the schedule of the Town and Country Planning (Use Classes) order 1987 and the Tenant would be responsible for obtaining in writing from Kirklees MBC the use for any other purpose if required.